The Hours - My Memoir: Nobody Knows! 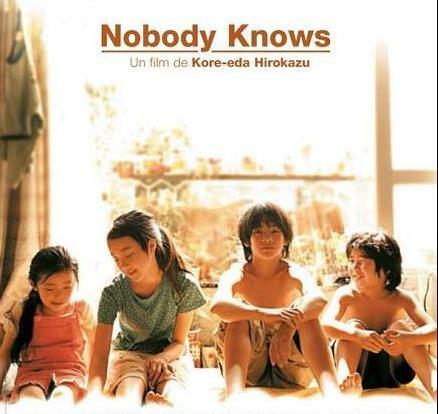 Nobody knows (Dare mo shiranai) is based on a true story and a very very sad story about four kids being abandoned by their mother and are allowed to survive on their own without anyone knowing that they exist. The movie begins with a mother and son shifting to a new apartment, happily introducing them to the neighborhood. But what no one knows is that their baggage hides two kids and a third is to arrive later that night without being noticed. Four kids, all from a different father are not registered and live secretly with their mother in a apartment. They never get to go out except for the eldest son, who brings food and cooks for the others and one day, the mother disappears out of their life along with her new boy friend. The kids are forced to continue living alone in the apartment secretly. "Nobody knows" is a sad story; it’s difficult to watch the kids suffer without shedding one drop of tear; they face life as it comes and learn to cope with the situation without even knowing to complain. The story is based on true events that happened in Tokyo in late 1980's. This 2004 movie captures the sorrow and silence of the kids in a brilliant manner. The performance by every kid is amazing and heartwarming. Phew! Sounds like a must watch! Hey, what happened in the end? No mother should do this to her kids..seems like a painful tragedy. Indrani - ...One of the kid dies...and the kid is secretly buried....the true story is even more depressing...you can find the whole story in wikipidea. hearttouching story, must watch movie. First time I have a review in my life.. it's so touching .. kudos to ajeya.. tu es vraiment genial!! This is the first time in my life i have read the review of an movie and this one is so touching.. kudos to ajeya.. tu es vraiment genial! !